If 2013 was the year of the 4K Ultra HD TV, then 2014 (or as I now like to call it 2014K) is fast shaping up to be the year of 4K content. Whether you want to create your own or kick-back and watch something rather more professional, it's all going down this year. The Sony AX100E 4K Handycam, unveiled at last week's International CES and due this summer priced just under £2,000, looks sensational. Dramatically smaller than its pro-centric FDR-AX1E predecessor, it shoots Ultra HD in XAVC S, which is a derivation of XAVC, the 4K video format developed by Sony for TV production. Panasonic is also prepping a 4K consumer shooter, a lightweight wearable action-cam styled on its head-mountable A100. Perfect for skiing apparently, which I will obviously do never. "A senior engineer at a large Japanese electronics company had already warned me that behind the scenes the 4K Blu-ray situation was 'chaos!'" Of course, the biggest 4K content news hails from Netflix. The non-contract streaming outfit has confirmed that it will be launching a UHD service this spring. "We are at the forefront of 4K," proclaimed Netflix director of corporate communications Joris Evers when I met him in Vegas. "TV manufacturers are not going to sell any TVs unless there's stuff to watch on them, that takes advantage of the technology advances built into them. This is the first time that the best video quality possible is only going to be available through the internet. We believe Netflix will be the way most people will get 4K content." Evers is probably right. 4K Blu-ray was notable only by its absence on the CES showfloor. Although the Blu-ray Disc Association had been talking up plans to upgrade their disc spec beforehand, there wasn't a peep to be heard from any peeps. Not that I was surprised. A senior engineer at a large Japanese electronics company had already warned me that behind the scenes the 4K BD situation was "chaos!" It's important to realise that 4K Netflix will only be available on Ultra HD screens sporting an integrated HEVC h.265 decoder. That rules out all of last year's TV launches, including the forward-facing HDMI 2.0 compatible Panasonic WT600. Not that there's going to be any shortage of new HEVC-enabled tellies to choose from. But you might need to learn to love the curve. Curling screens littered the Las Vegas convention centre like week-old sandwiches. Thankfully most appeared a good deal more appetising than stale bread. I'd even go so far as to say the prototype 105-inch 21:9 ratio curved Ultra HD screens from LG and Samsung looked drop-dead amazing, although even Peter Andre and his 60 Minute Makeover team would struggle to find a way of getting them into my living room without demolishing most of the house. Bendy TVs, honestly - what is the point? Away from the CES showfloor, Samsung previewed upcoming tech for future 4K lines. This proved to be pretty fascinating. 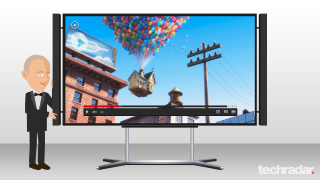 One engineering team is working out ways to improve the dynamic range of 4K sets, showing a prototype high-brightness 85-inch panel which peaks at 1000 nits of brightness. A side by side comparison of current and next-gen panels used a sequence from J.J. Abrams Star Trek: Into Darkness for illustration. Both displays looked superb, but unfortunately when Abrams' trademark lens flare hit the high-brightness prototype my retinas exploded. The brand's boffins have also developed a high contrast image processor which uses object-based contrast enhancement to give even greater delineation with 4K sources. The aim, I was told, is to help create an almost tangible 3D effect. "It helps create that sense of immersion," I was told. Perhaps bizarrely, the engineers responsible said there were no plans to offer similar immersion on flat 4K screens. Disappointing perhaps, but salvation could be at hand. Both LG and Samsung also teased prototype flexible 4K UHD screens at CES which allow users to remotely alter the degree of curvature. So thanks to some ingenious over-engineering, the world's biggest TV brands have made it possible to make curved screens flat again. Remember when I said we were entering a new Age of Stupid? Well that. Again.